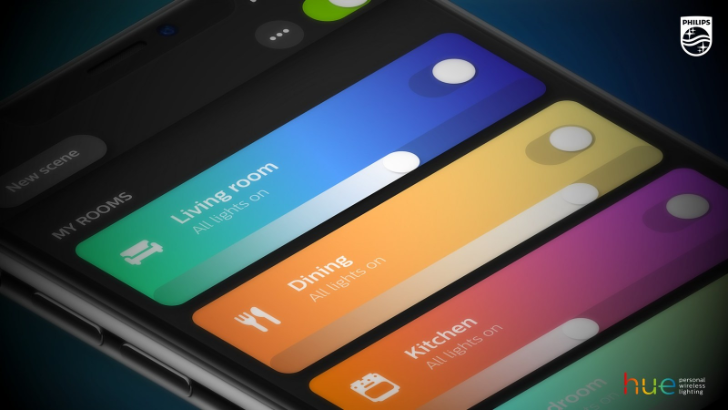 Hue’s revamped power-on settings will let users choose how lights come on when power is cycled, rather than offering a binary choice between full brightness and the last used setting. So if, for example, you’d like the Hue bulb in your bedroom lamp to always be dim and cool when you power the lamp on, you’ll have that option. Personally, I’ve always wanted the bulbs to check the time use the appropriate scene when turning on; unfortunately, it doesn’t seem like this update allows for that. Users will be able to set custom power-on behavior starting in February. Additionally, Hue bulbs will soon be able to do 30-minute wind-down and wake-up routines in conjunction with the Google Assistant. “Hey Google, sleep the lights” will cause these the lights to gradually warm and fade over a half hour at a time of your choosing. “Hey Google, turn on Gentle Wake Up” will make Hue bulbs brighten in a way that mimics sunrise starting a half hour before morning alarms set through Google Assistant. It’s not clear whether it’s possible to have the effect apply to alarms set in other ways — but since you’re able to tie Assistant routines to alarms in Google’s Clock app, there’s probably a way. The sleep and wake-up functionality should be available by March. CES – Las Vegas, Nevada (USA)– Signify (Euronext: LIGHT), the world leader in lighting, has collaborated with Google to give consumers the ability to use voice commands with the Google Assistant to activate sleep and wake light effects, using Philips Hue functionality. These effects replicate the optimum lighting for winding down before bed and waking up naturally in the morning. It represents the first integration of the Philips Hue sleep and wake up feature with a digital assistant platform. Research is increasingly showing the important role light plays in how we feel and how well we sleep. Melatonin, the hormone that helps to regulate our wake and sleep cycle, is influenced by light, whether that’s natural or artificial light. By having the right light as we prepare for bed, we can get a better night’s sleep, and waking up with the right light can help us start the day feeling more energized. While many people need an alarm clock to wake up in the morning, by using light that simulates a sunrise with gradually increasing light levels before the alarm goes off, you can improve your well-being, mood and cognitive performance later in the day.